Curious about where the Trolley goes in Birmingham? We were! After reading a recent post about the trolleys in Lawrenceville, GA providing a tour of historical sites, we wanted to know if we could do the same in Birmingham. We wanted to know where our trolleys go, what the schedule is, and how much is it to ride? Does it stop at Railroad Park? How often does it make a route? And how can we turn this into a benefit for tourists and visitors? Well, here’s the scoop! It costs 50¢! And here’s the full schedule! 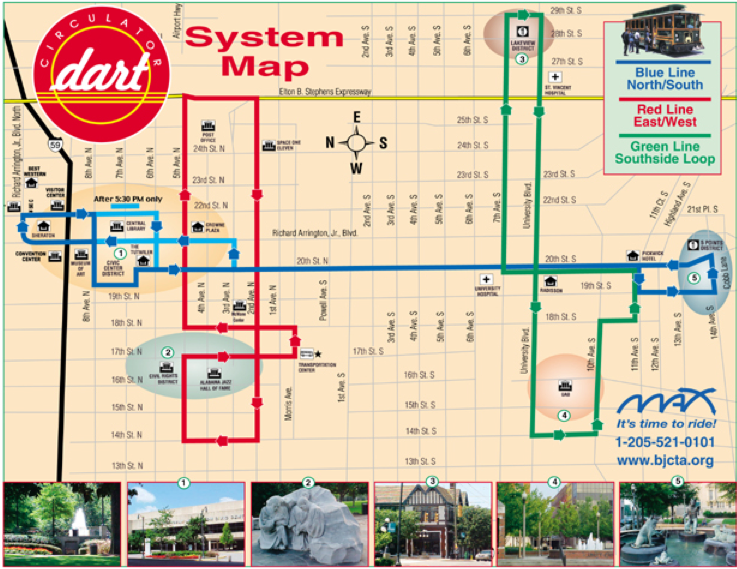 It runs every 10-20 minutes on the three routes below and The Red Line stops at Terminal Station – near Railroad Park. Currently it travels from the City Center to the Convention Center to Five Points South. What are the tourism possibilities? What COULD they be? Stay tuned! This entry was posted on Friday, March 25th, 2011 at 11:05 am	and is filed under Birmingham Information, Railroads & Industry. You can follow any responses to this entry through the RSS 2.0 feed. You can leave a response, or trackback from your own site.